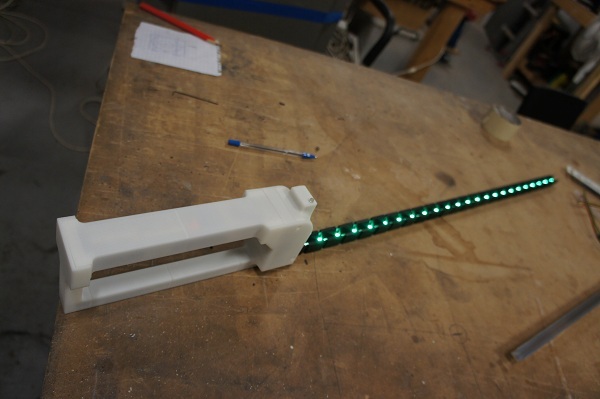 Madox designed the BitBltBlade, a WiFi controlled POV lightsaber designed to display images in conjunction with long exposure photography. The BitBltBlade uses the hackable TP-Link TL-WR703N router and Kean’s USB Expander board to wirelessly control a strip of RGB LEDs. The concept of operation is that the user would use their smartphone which can upload photos (aka almost everything except an iPhone) to connect to the router’s access point and access a web interface. Using the web interface, the user can then select to upload a small picture or photo to the router which is then rescaled and converted into a format to be ‘displayed’. The user can then set options such as timing between columns which affects how fast the display updates. View the BitBitBlade in action below. This entry was posted on Tuesday, October 9th, 2012 at 1:00 pm	and is filed under POV Toy, wireless. You can follow any responses to this entry through the RSS 2.0 feed. You can skip to the end and leave a response. Pinging is currently not allowed. iPhones with iOS 6 can upload photos! @Tom ahhhh so you can! Just tested with an IOS6 user who didn’t know that (basic) feature was added!